What a pleasure & a joy it was to meet with you on Friday. 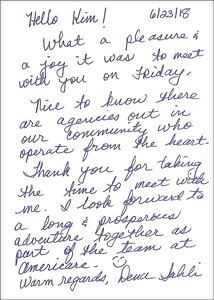 Nice to know there are agencies out in our community who operate from the heart. Thank you for taking the time to meet with me. I look forward to a long & prosperous adventure together as part of the team at AmeriCare.